Having a web presence is a great way to do that since a wide range of potential customers can view your products and services this way. Although it may seem like a daunting task, it doesn’t have to be expensive or complicated. Here are a few simple steps you can take to launch a professional looking website and reach more customers. If you are a small business, you want to reach customers and build your business. Having a web presence is a great way to do that since a wide range of potential customers can view your products and services this way. Although it may seem like a daunting task, it doesn’t have to be expensive or complicated. Here are a few simple steps you can take to launch a professional looking website and reach more customers. Create a domain name. Select a domain name that is easy to pronounce and remember. Try to keep it short, if possible. Think of words that someone would use when searching for your business. You can also consider using your location as part of your domain name (e.g., www.xyzremodelingchicago.com). After you have chosen a few domain names, run them through a name registrar database to see if they are available. If you find that the name is already taken, try using another phrase in the name. While “.com” suffixes are easy to remember and most commonly used, you can select a different suffix, such as .net, .biz, or .info, if the domain name you desire is taken. Once you’ve found an available domain name, register it. Fees and terms vary per service so it pays to do some comparison shopping before agreeing on a particular platform. Consider the cost to register the name and how much it will be to renew it annually. Get a business email address. Using a personalized business email address as opposed to say a gmail.com address gives your business a more professional appearance. Google offers custom email addresses for businesses through G Suite. The service is not expensive—prices range from $5 to $25 monthly, has several features, and is easy to set up. Choose a website builder and template design. It is important that you select something that has the features you will use and that you can understand. Keeping it simple will benefit both you and your customers. Knowing your level of technical skill and design capabilities is also important. Popular website builders such as Weeby, Wordpress, and Wix.com are a few you might want to consider. Again, think about how you want users to use your website, what features will be beneficial to them, and how capable you are in designing your website. Some website builders provide templates to create a well designed, professional looking website. Make a list of what you want your website to include and then look over the options available to select the right one. If you need help selecting a template, websitebuilderexpert.com has great tips on choosing content width, a home page header, and menu bar design. 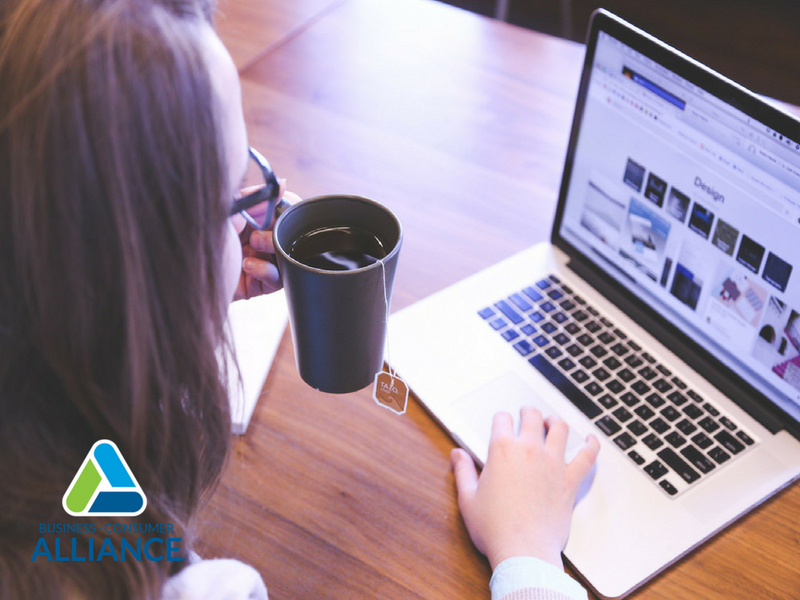 Add your Business Consumer Alliance logo so visitors have a quick link to check your reliability. After you create your website, have someone else look it over. Make sure it is functional and ask their opinion on whether it’s easy to navigate. Check for spelling errors or incomplete information. You want to make sure that the information is accurate and that it looks as professional as possible. Make sure to check the website from time to time to ensure the information is up-to-date. For example, if you move or change your phone number, update this on your website right away. Same with email addresses or contact persons. One of the main concerns customers have with businesses is not being able to contact them. Avoid this issue by keeping your information current. As your business carries on, you’ll find ways to enhance your website, customizing areas to cater to your visitors and consumer base. Creating your own website can be simple and cost effective, especially for small businesses and startups. With these simple tools you’ll be on your way.